If you are looking to travel to Israel, then World Express Travel can help you create the perfect trip. Israel is a beautiful country, full of breathtaking landscapes and a rich cultural history. Feel free to give us a call for more information about how to set up your Israel vacation. 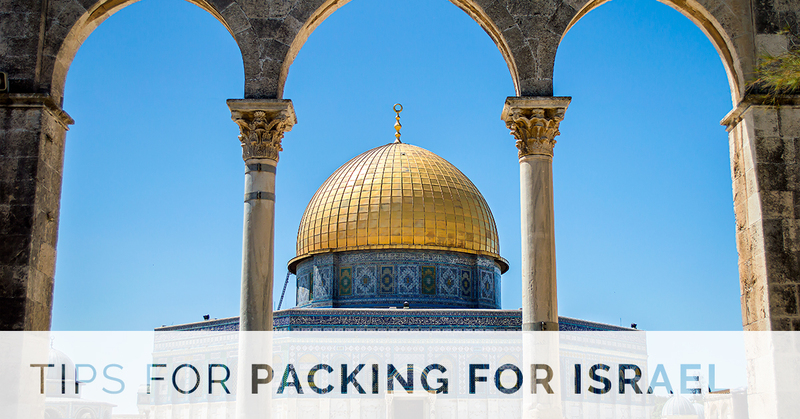 In the meantime, here are some tips to make packing for Israel easier. Any time you travel, you should consider whether you are bringing the appropriate footwear. Nothing stops a vacation in its tracks like aching feet. Luckily, for an Israel trip, you won’t need any special hiking boots. However, outdoor running shoes (with tough soles) usually come in handy, especially for the more active vacationers. As there are many water activities in Israel to enjoy, it is probably a good idea to bring an extra pair of water friendly shoes, especially if you are planning an excursion to the Dead Sea, rafting, or going on a water hike. Israel has a generally casual culture on a day to day basis. It isn’t that uncommon to see business executives sporting jeans and a t-shirt at work. However, make sure to pack modest attire as well. That means covering exposed shoulders and knees. This way, you can enjoy all of the rich historical religious sites in the country like the Western Wall while fitting in with the culture’s customs. Modest attire is also usually worn for Shabbat, so keep that in mind as well. The sun is hotter and stronger in Israel than it is in almost any place in the continental United States. For that reason, it is less of a choice to bring water and more of a necessity. For convenience, camel packs work great. Whatever your preferred hydration methods, make sure you leave enough room in a travel bag or backpack to store your water. Additionally, before you board your plan for Israel, make sure that you have spent time familiarizing yourself with the geography of the areas you will visit. If you can get your hands on some maps for the area, they may make your trip go smoother. If you are looking to travel to Israel, then World Express Travel is happy to help! For more information on how to setup the perfect Israel vacation, please do not hesitate to give us a call at your earliest convenience. One of our friendly and knowledgeable representatives will be happy to answer any questions that you may have.